Welcome to the online home of K's Caramels! An independently-owned business, K's Caramels is dedicated to making the most decadent confections you've ever tasted. They're made in small batches to ensure optimum freshness and quality, hand-cut, individually hand-wrapped in confectioner's papers, and packaged into clear cellophane bags. I proudly feature my signature Golden Caramels, and my sinfully delicious Chocolate Caramels in one-pound and half-pound packages. They have a nostalgic look and old-fashioned flavor, thanks to the freshest ingredients and no additives or preservatives! 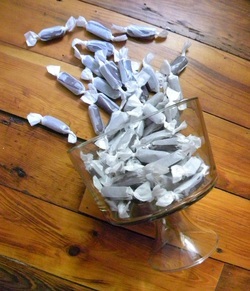 Other available flavors include my own Lavender Fleur De Sel Caramels, Salted Golden Caramels, and Coffee Caramels. More flavors coming soon! For me, this business is not just about making and selling confections. It's about relationships. Nurturing my customers, and treating them as family. The product is simply a way for me to helping people get in touch with their own desire, joy, appreciation, wonderment, and fond memories. Thank you for visiting! I look forward to adding some sweetness to your days.